Good things indeed come to those who wait. 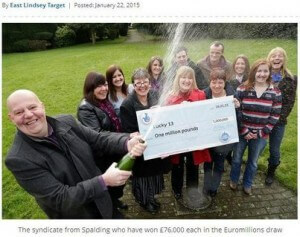 A lottery playing syndicate originally had twenty members when they started ten weeks ago, but seven members dropped out. That left thirteen lucky members who will each receive a £76,000 share of a million dollar jackpot they won in the EuroMillions Millionaire Maker draw on Friday. Syndicate leader Mark and member Karen who kept the tickets learned of their win early, but had to wait till they can confirm the win with Camelot before telling the rest. The winners who all work at food manufacturing firm, Bakkavor in Spalding, do not think that their share will allow them to retire. That has not stopped them from planning what to do with their winnings which now range from getting a new mower, home improvements, and to going off on vacation.